For their July 4th special, Peacekeeper was offering a B1G1F along with free shipping on certain lip products, so I finally bit. I have been trying to buy their popular nailpolish remover for 2 months now and I can never catch it in stock, so I figured I would try something else in the meantime. I picked up a lip gloss in Eternal Equity and a lipstick in Paint Me Accepting. The total was $14 for both shipped. They now offer free shipping on all items, so I will probably be back to try something else. My swatch photos were miserable, but the product photo does a good job at showing the colors. I like both colors very much. On the website, they recommend particular colors based on your hair and skin. These are the redhead colors. I really like the design of the lipstick tube. It has a fat bottom so it sits flat and steady, no teetering on the edge of the sink. The color is smooth and solid, doesn't appear to move around much at all. Kind of iffy on the lip gloss. Like the color and a standard doe foot brush. It is castor oil based and I can really taste it on my lips. It also has a bit of grit to it. I can deal with the castor oil, but the grit may be a deal breaker. It's not super gritty, but just enough to be annoying. My LOL moment came when I saw the shipping box. 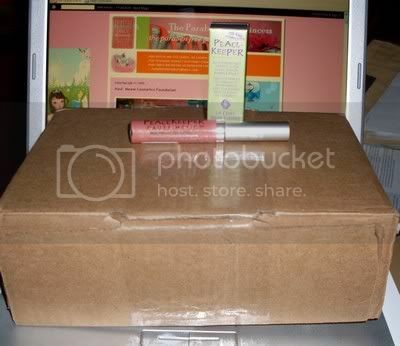 This box is much too big and too nice to ship a couple of lippies in. I would have expected an envelope. Reminded me of Amazon where you buy a toaster and they ship it in a refrigerator box. But, it will definitely be reused the next time I need to send something out. PeaceKeeper Cause-Metrics is the first cosmetic line to give all of its after tax distributable profits to Women's Health Advocacy and Human Rights Issues. Reader Mail: Yes to Carrots - Not So Fast! Holy Cow! No Split Ends!! !